With Facebook beefing up its video capabilities, fashion brands cranked out a mix of short and long clips for New York Fashion Week. Exclusive data from Socialbakers tracked video activity across all of the Fashion Week designers' pages to see which posts people interacted with most. The upshot: High-quality video that shows off runway shows beats behind-the-scenes sneak peeks. The social vendor counted the number of videos uploaded between Feb. 11 and Feb. 18 (this Friday is technically the event's final day, but the data is still fairly comprehensive) and then gave each brand an interaction score based on the number of Likes, comments and shares on videos. The designers posted a total of 55 videos to their pages in the past week—89 percent of which were uploaded directly from Facebook. Seven percent of the clips were posted from YouTube videos, while 4 percent came from Vimeo. Spanish fashion label Desigual grabbed the No. 1 spot on Socialbakers' chart. The brand posted two videos during Fashion Week—both after its show on Feb. 12, where fashion model Winnie Harlow walked the runway. Harlow's vitiligo, a skin pigment disease, made her the talk of Fashion Week. 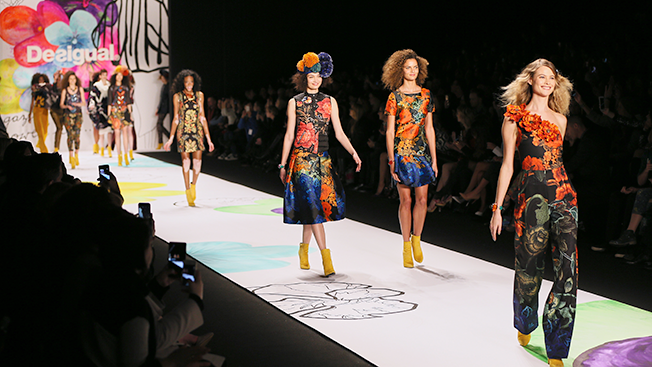 One of the spots shows off Desigual's new spring collection, and the other recaps its runway show. The short clips brought in a total of 6,324 interactions. Meanwhile, Michael Kors took a different approach that seemed to pay off. The American designer only posted one Fashion Week-themed video—the 15-second clip teasing the live streaming of its show generated 5,466 interactions. Similarly, Carolina Herrera grabbed the No. 3 spot in terms of social engagement with a video hyping its upcoming show. Despite posting a whopping 12 videos, BCBG Max Azria took the No. 7 spot on the chart with 1,196 interactions. Instead of posting stylized videos, the designer posted a bunch of behind-the-scenes videos the past week. To be fair, BCBG Max Azria has nearly 471,000 Facebook fans compared to Desigual's more than 3.5 million, Michael Kors' 16.6 million and Carolina Herrera's 1 million. And there's a good chance some of these videos got a boost with paid ads. Take a look at all of the Facebook data below.